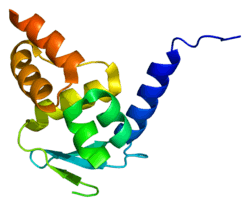 Zinc finger and BTB domain-containing protein 7A is a protein that in humans is encoded by the ZBTB7A gene. ZBTB7A has been shown to interact with BCL6. ↑ Morrison DJ, Pendergrast PS, Stavropoulos P, Colmenares SU, Kobayashi R, Hernandez N (Apr 1999). "FBI-1, a factor that binds to the HIV-1 inducer of short transcripts (IST), is a POZ domain protein". Nucleic Acids Res. 27 (5): 1251–62. doi:10.1093/nar/27.5.1251. PMC 148309 . PMID 9973611. ↑ Davies JM, Hawe N, Kabarowski J, Huang QH, Zhu J, Brand NJ, Leprince D, Dhordain P, Cook M, Morriss-Kay G, Zelent A (Feb 1999). "Novel BTB/POZ domain zinc-finger protein, LRF, is a potential target of the LAZ-3/BCL-6 oncogene". Oncogene. 18 (2): 365–75. doi:10.1038/sj.onc.1202332. PMID 9927193. ↑ "Entrez Gene: ZBTB7A zinc finger and BTB domain containing 7A". ↑ Davies JM, Hawe N, Kabarowski J, Huang QH, Zhu J, Brand NJ, Leprince D, Dhordain P, Cook M, Morriss-Kay G, Zelent A (January 1999). "Novel BTB/POZ domain zinc-finger protein, LRF, is a potential target of the LAZ-3/BCL-6 oncogene". Oncogene. 18 (2): 365–75. doi:10.1038/sj.onc.1202332. PMID 9927193. Pendergrast PS, Wang C, Hernandez N, Huang S (2002). "FBI-1 Can Stimulate HIV-1 Tat Activity and Is Targeted to a Novel Subnuclear Domain that Includes the Tat-P-TEFb—containing Nuclear Speckles". Mol. Biol. Cell. 13 (3): 915–29. doi:10.1091/mbc.01-08-0383. PMC 99609 . PMID 11907272. Lee DK, Suh D, Edenberg HJ, Hur MW (2002). "POZ domain transcription factor, FBI-1, represses transcription of ADH5/FDH by interacting with the zinc finger and interfering with DNA binding activity of Sp1". J. Biol. Chem. 277 (30): 26761–8. doi:10.1074/jbc.M202078200. PMID 12004059. Pessler F, Hernandez N (2003). "Flexible DNA binding of the BTB/POZ-domain protein FBI-1". J. Biol. Chem. 278 (31): 29327–35. doi:10.1074/jbc.M302980200. PMID 12750370. Laudes M, Christodoulides C, Sewter C, et al. (2004). "Role of the POZ zinc finger transcription factor FBI-1 in human and murine adipogenesis". J. Biol. Chem. 279 (12): 11711–8. doi:10.1074/jbc.M310240200. PMID 14701838. Liu CJ, Prazak L, Fajardo M, et al. (2004). "Leukemia/lymphoma-related factor, a POZ domain-containing transcriptional repressor, interacts with histone deacetylase-1 and inhibits cartilage oligomeric matrix protein gene expression and chondrogenesis". J. Biol. Chem. 279 (45): 47081–91. doi:10.1074/jbc.M405288200. PMID 15337766. Maeda T, Hobbs RM, Merghoub T, et al. (2005). "Role of the proto-oncogene Pokémon in cellular transformation and ARF repression". Nature. 433 (7023): 278–85. doi:10.1038/nature03203. PMID 15662416. Lee DK, Kang JE, Park HJ, et al. (2005). "FBI-1 enhances transcription of the nuclear factor-kappaB (NF-kappaB)-responsive E-selectin gene by nuclear localization of the p65 subunit of NF-kappaB". J. Biol. Chem. 280 (30): 27783–91. doi:10.1074/jbc.M504909200. PMID 15917220. Roh HE, Lee MN, Jeon BN, et al. (2007). "Regulation of Pokémon 1 activity by sumoylation". Cell. Physiol. Biochem. 20 (1–4): 167–80. doi:10.1159/000104164. PMID 17595526.